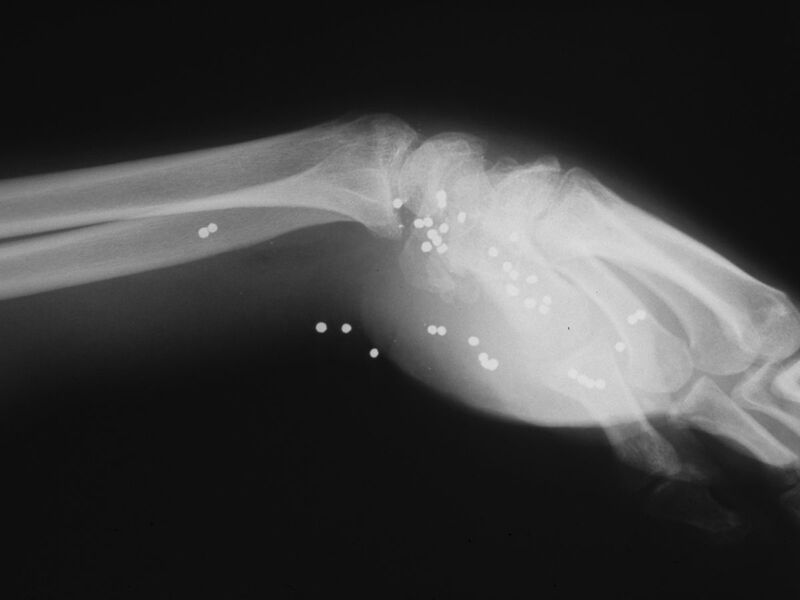 Gunshot injuries present a variety of problems - multiple level injury, ill defined zone of injury, retained foreign body, social issues and more. 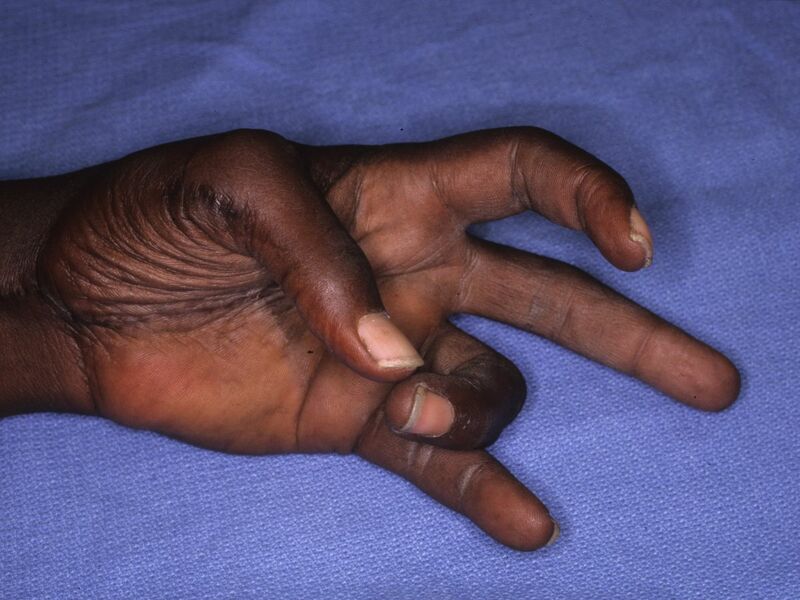 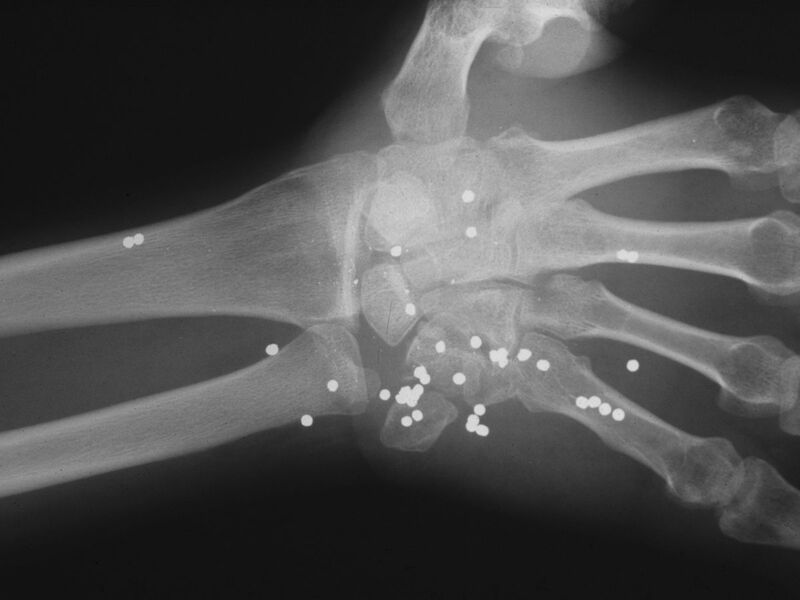 This young adult presented one year after sustaining a close range gun shot injury of his left palm, which had been treated with local wound care. No records were available, and he was vague about the details of the injury. 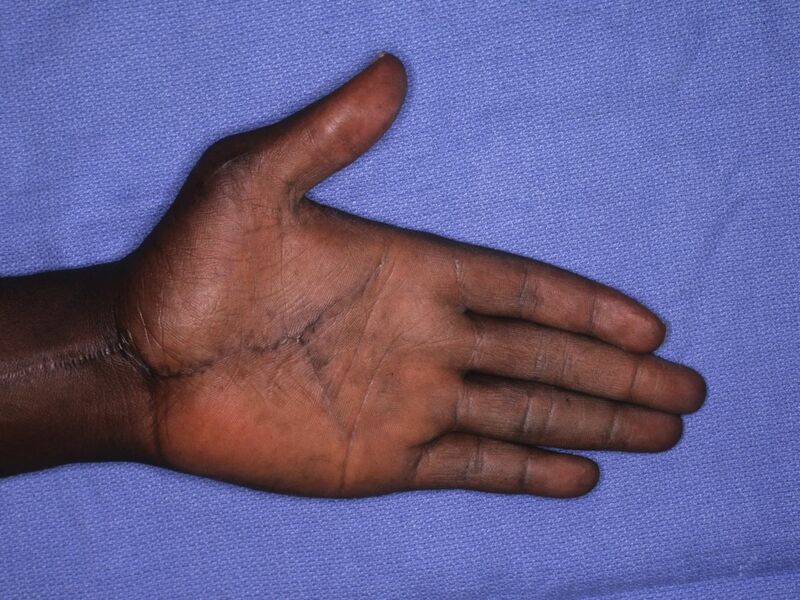 He had complete median nerve loss, a stiff hand and a healed wound in the central proximal palm. Xrays were consistent with retained shotgun pellets, most likely turkey shot (#4 shot, 135 pellets per cartridge). Reconstruction posed a challenge, compounded by the likelihood of poor compliance postop. 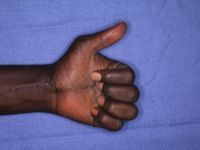 Serum lead levels were tested, and were elevated. 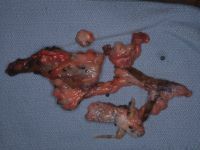 This additional factor tipped the risk/benefit ratio in favor of debridement and reconstruction. 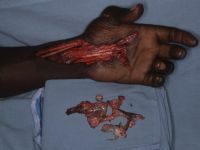 The wound was excised and the palm explored through an extensile Y incision. The distal median nerve was segmentally absent, and was reconstructed with sural nerve grafts. 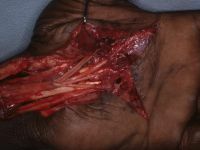 A palmaris opponensplasty was performed, routed deep to the flexor carpi radialis tendon to maximize abduction and prevent problems from bowstringing. 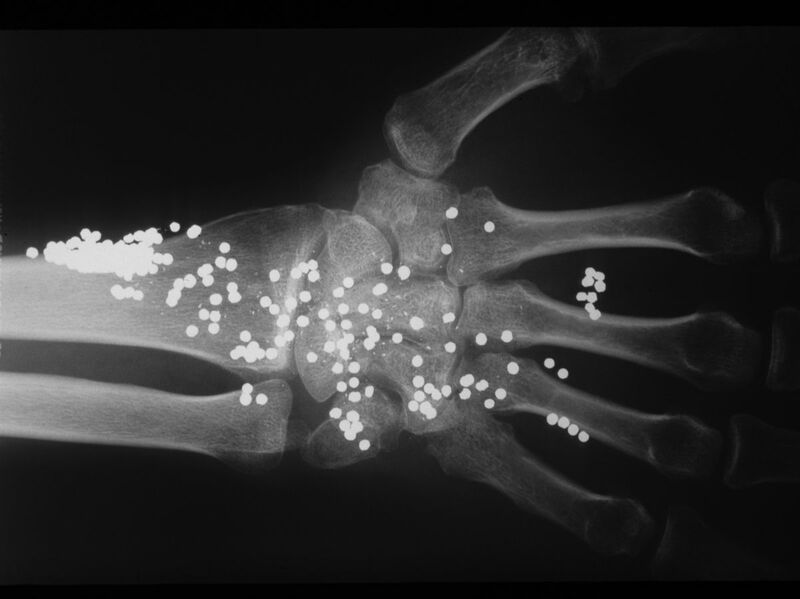 Debrided tissues were found to include the plastic shotgun cartridge wad along with many pellets. 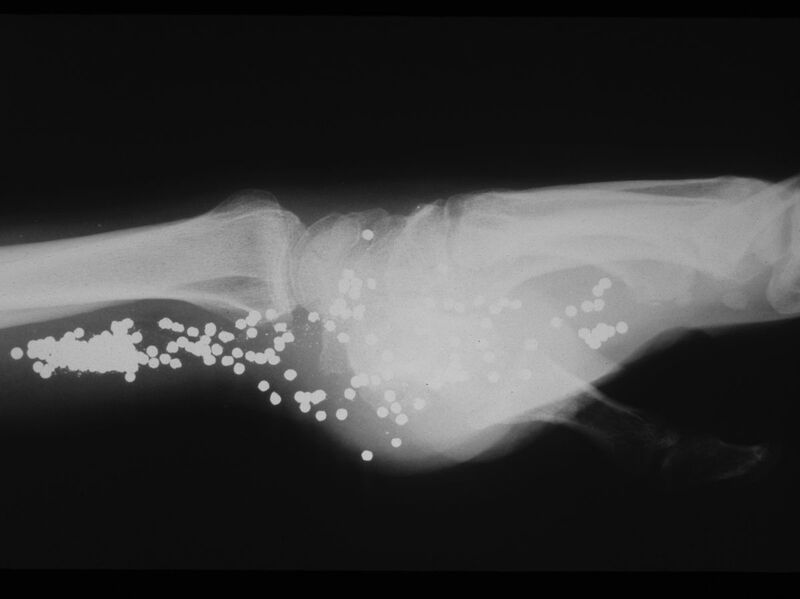 Postop xrays showing lead debulking. Early nerve recovery was encouraging, but the patient was lost to followup, and there was not an opportunity to check lead levels late after surgery.